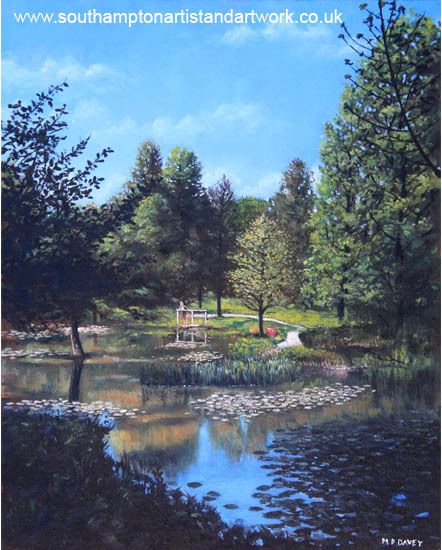 This is an oil painting of one of the landscaped gardens at Hillier Gardens, near to Romsey and Southampton, in the UK, during late summer. The garden was set up in 1953 by Sir Harold Hillier and now covers 180 acres. The collection covers a diverse collection of hardy trees and shrubs from around the world. This oil painting illustrates the main lake in the center of the gardens, during summer. The large amount of trees makes the landscape seem quite dark, but the bright reflection in the water helps to balance out the tones within the painting. A woman can be seen in the distance, resting on the bridge. Painted in 2012 on a 16" x 20" canvas.